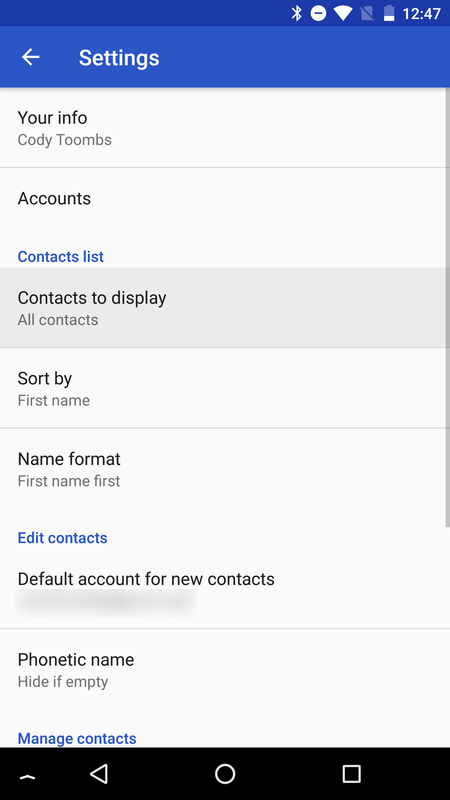 If you've been craving some visual changes on your phone, an update to Google's Contacts app is rolling out with a few tweaks that are pretty noticeable. This version brings back full-bleed contact photos and adds a quick access bar. There are also a few other visual tweaks and a filter for the contact list has been moved. As always, you can grab the latest update from the APK Mirror link at the bottom. An official changelog was posted on October 2nd, 2017. 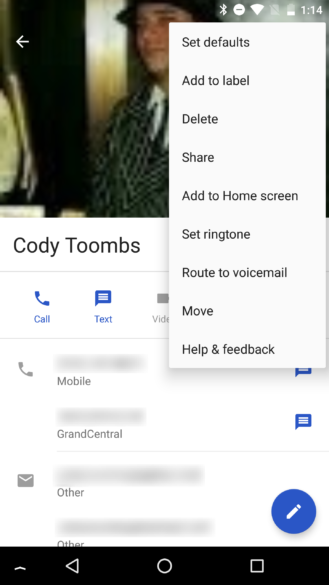 It also mentions a MERGE ALL button for suggested contact merges, so you won't have to hit the button repeatedly for all suggestions. There should also be a new "Directory" section on business contacts that will contain some business-specific details like manager name, department, etc. This resembles the "About" section described below. It looks like we caught the rest. 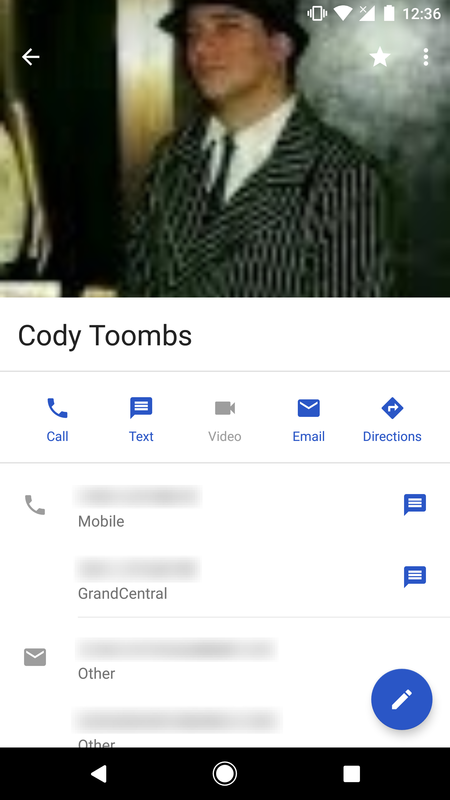 The first and most noticeable change is that we're again looking at full size contact photos again. This marks a return to the style used prior to the v2.0 update released earlier this year. I suppose the much smaller photos (called "chips") probably didn't work out with users. While this look is certainly easier to see, it tends to also bring out the painfully low resolution of synced contact photos. The other striking addition is a brand new quick access bar running across the screen just below the contact name. It offers five buttons, including: Call, Text, Video, Email, and Directions. 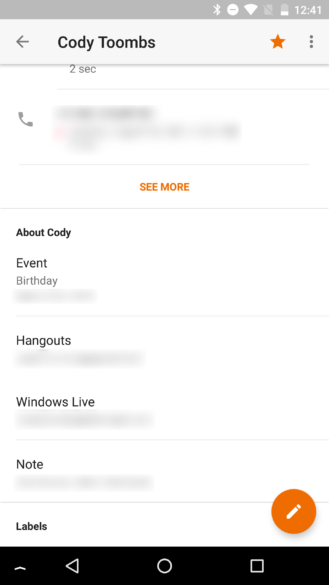 Tap any one of them and you'll either be taken to the default app for that operation, or a popup will appear first with a list of options if there are more than one entry for that type of thing (e.g. 2 or more phone numbers). This might not make a big difference for phone numbers, which are already at the top of the page, but it feels faster and more intuitive than scrolling down the page to find directions. There's also one odd little behavioral change. It used to be possible to swipe down on the contact page to dismiss it and return to the contact list. That doesn't work anymore. 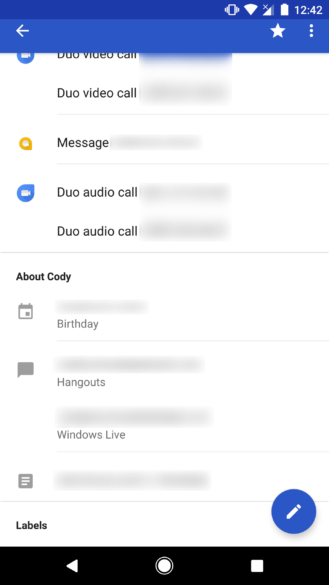 I would normally find that to be an improvement because it was too easy to dismiss a page by accident while scrolling back up, but it means that other apps calling up contact pages have also lost this gesture. 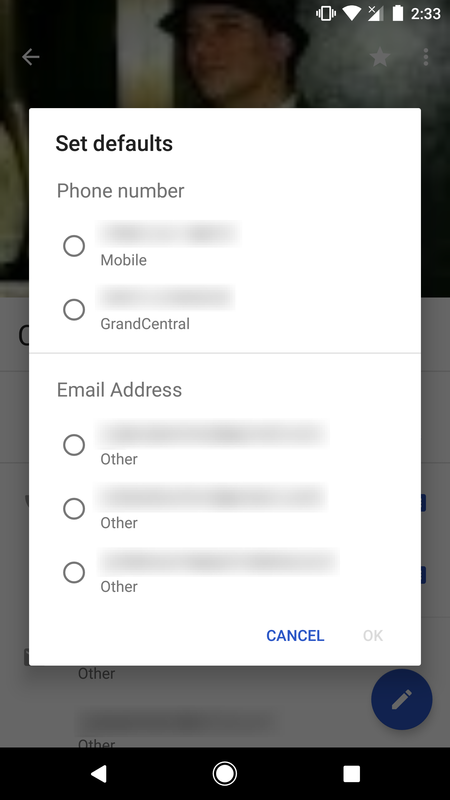 A new command has been added to the overflow menu that makes it easy to set the default phone number, email address, and physical address for a contact. You could already long-press on items and get a menu with the option to set it as a default, but the new command from the overflow menu is a bit faster. 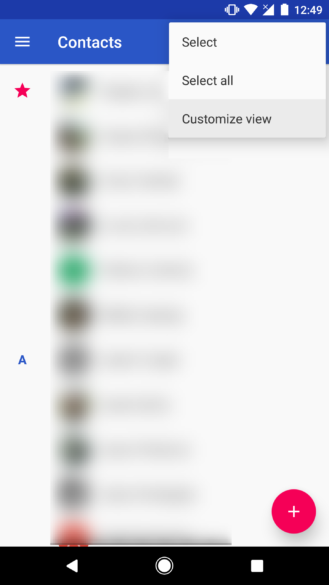 Rounding out the changes to the contact pages, there's a simple visual tweak to the About section. Icons have been added for each subsection and each line is indented to line up with the rest of the page. The order of title and content was also swapped. It's a minor thing, but I think it looks much better. 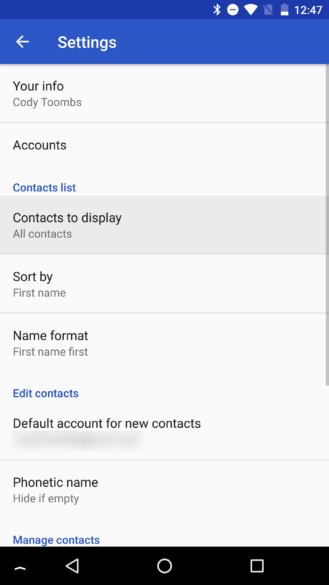 If you happen to use the "Contacts to display" filter with any frequency, you'll probably be happy to know it has been moved from the Settings screen to the overflow menu on the contact list. 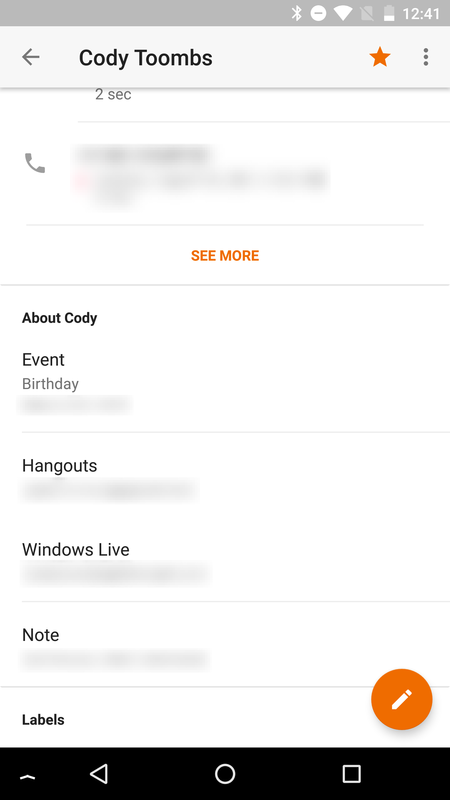 It's now called "Customize view," but it does the same thing. 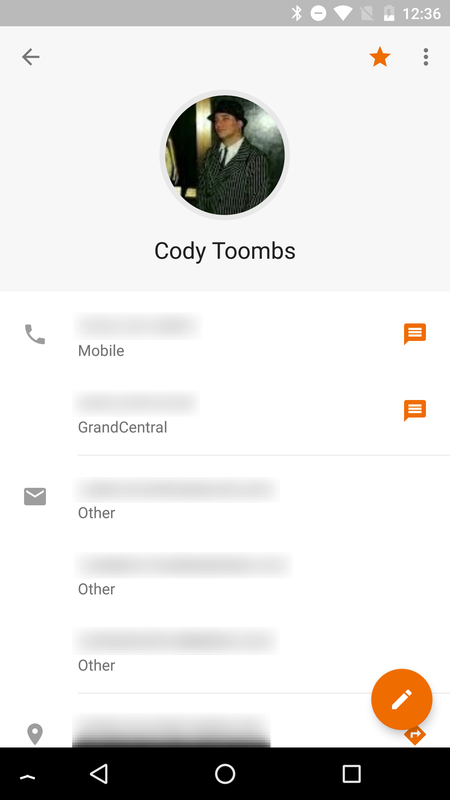 For those that haven't used this feature, it allows you to see only contacts with certain labels attached to them.